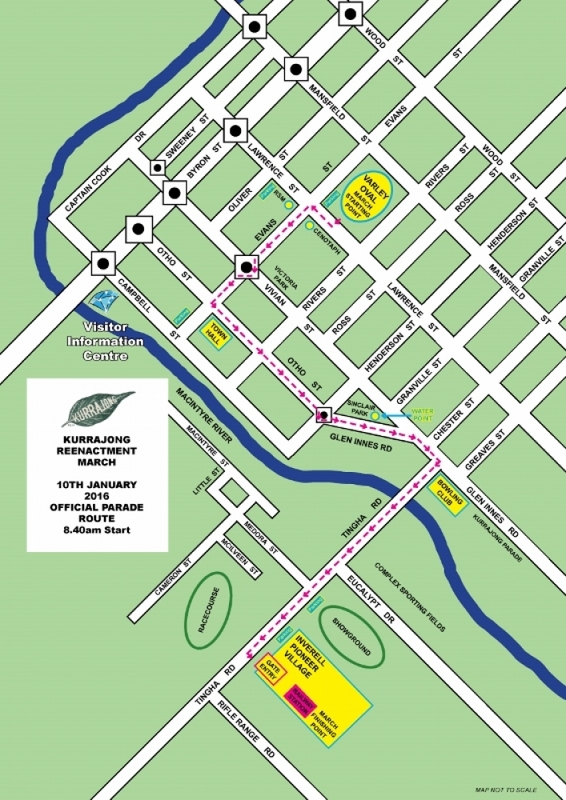 A number of people have asked why the Kurrajong Re-enactment March did not follow the original route of the 1916 march along Otho and Byron Streets to Ring Street where the Railway Station was then located. 1. The parade ground where the 1916 march assembled is not in its original form and there was nowhere nearby large enough to assemble the march. 2. There are no facilities at the site of the old Railway Station for a gathering of people. 3. One of the requirements for holding the re-enactment march was that it had to pass places of significance e.g. at Inverell this included the Cenotaph, Honor Roll, RSL and RSM, Victoria Park. 4. The Old Railway Station building at the Inverell Pioneer Village provided the best location for the end of the march activities. 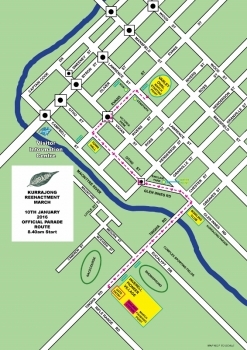 The march did follow some of the original route in Otho Street from the Town Hall to the Skybridge building, although in the opposite direction to the 1916 event. Varley Oval was the best venue for assembling the re-enactment march and enabled the march to comply with the Transport Management Centre’s requirements. The order of the Re-enactment march followed as closely as possible that of the 1916 march which was led by NSW Mounted Police, Light Horsemen, Inverell Pipe Band, returned Gallipoli Veterans, Officers in Charge, The Inverell Austral Band, and departing recruits who carried banners proclaiming, ”Inverell’s Hundred for the New Army” and two with the word “Kurrajongs”. They were followed by Inverell Cadets and the Model and Salvation Army Bands and the Fire Brigade. The 1916 recruits wore white hats provided by the Government, an Inverell medal and a sprig of Kurrajong leaf. A huge thank you to all who participated in this historic event.